The Gilbough Program, founded in 1980, is one of the leading residential treatment centers in the country for Prader-Willi Syndrome (PWS) and one of only a few that work with both children and adults who face this unusual genetic disorder. People born with PWS confront so many challenges, including uncontrollable appetite, limited motor skills, mild to moderate mental retardation, and compulsive behaviors. We work closely with Boston’s prestigious Tufts-New England Medical Center, where we are helping establish a clinic for PWS. Thus far Prader-Willi Syndrome has no cure, but we are nationally known for helping those with PWS lead happier, more productive, and longer lives. Together with our residents and their families, we have created a successful diet that works. Many in our PWS community have lost substantial weight. They’ve also found improved health, with fewer illnesses and weight related problems, and higher self-esteem. 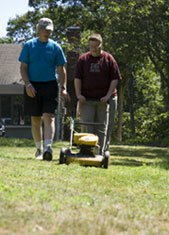 Gilbough offers our residents the same level of care and support that is a hallmark of all Latham’s programs. Residents enjoy living in attractive, comfortable homes situated in the local community. Each home is a reflection of the individuals who reside there. Residences may consist of a group home with other housemates, or in a home they share with a caregiver. Staff support is provided 24 hours a day, and we pay careful attention to monitoring and securing food, grocery shopping and preparing meals. Our professional team brings together academics, vocational training, medical and social services, the arts, sports, technology, and more. Our residents compete in Special Olympics, engage in meaningful work and vocational activities, and learn to explore the vast and interesting community in which they live.